If there’s one group of historical nasties you can always rely on to invoke some of literature’s most eldritch nightmares, it’s the Nazis. From the pages of Hellboy to just about every Call of Duty in recent memory, those militarised fascists love dabbling in the occult, so it’s no great shock to see them teaming up once more for Achtung! Cthulhu Tactics. 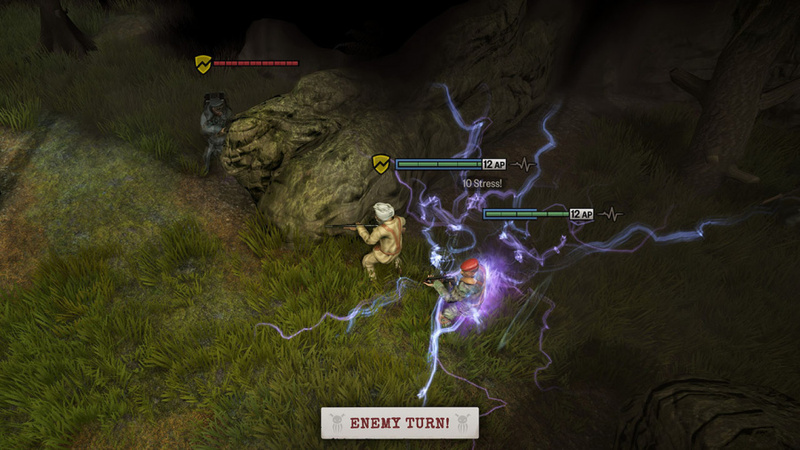 Mixing together turn-based battles, squad-based tactics and a dollop of horror, the end product is something that’s both refreshingly different and, oddly, a little dull at times. Based on the Achtung! Cthulhu tabletop RPG, you play a small squad from Section M, the Allies’ supernatural taskforce. Turns out those pesky Nazis have been - you guessed it - messing with dark forces near the forest of Ardennes, so you’ve been dispatched to root out the enemy and stop Hitler’s horrific plan to stem the Allied invasion of Europe. Of course, it’s all a ruse and when the Nazi trap is sprung, your squad finds itself behind enemy lines facing a foe using occultist technology and Lovecraftian monsters to hunt you down. One of the great things about the game is how hard it tries to weave in horror - a genre that one wouldn’t normally associate with something as dry and strategy focused as a tactics game - in order to sell its HP Lovecraft-inspired influences, rather than use them as a cheap pop culture reference. 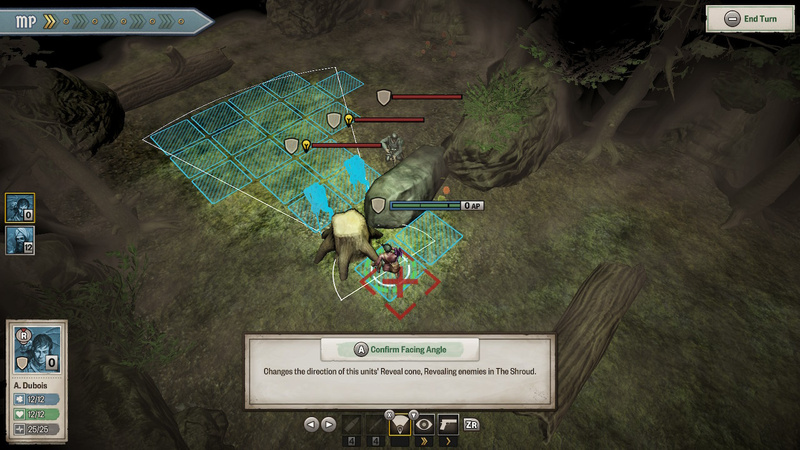 ACT refines its combat to small, contained battles where you can only see so far in any direction. This veil of darkness is called the Shroud, a kind of fog of war that makes every bit of progress fraught with potential danger. Not only does it tie into that very Lovecraftian trait of fearing the unknown, but it helps add an extra layer of unpredictability when you run into a Nazi death squad or a tentacle-flailing Shoggoth and get stung for your courage (or allowing your foes to retreat into a position you can no longer perceive as the Shroud only recedes so far around your squad). It’s a mechanic that forces you to be bold and accept the damage you’ll take in order to learn enemy positions and move your own forces accordingly. These close-quarters battles will be familiar to anyone that’s played Space Hulk Tactics or any of the X-COMs. With a four-man squad, you’ll need to utilise cover and ensure each operative is facing the best direction. Not only does this increase your chances of hitting your enemy when you do choose to attack, it also means using special abilities such as Overwatch (which enables one or more characters to automatically attack an enemy if they stray into their vision cone) can be utilised effectively. Combat uses two different currencies - AP and MP - and each one governs everything from movement to reloading a weapon. Action Points (AP) is the standard one that refills after every turn, and you can use it to position your squad behind cover, flank the enemy, or simply suppress them for a short while. Momentum Points (MP) are a little bit different, and enable you to perform special moves that can often mean the difference between losing and surviving a Nazi encounter. These abilities differ depending on the character - for instance, you might elect to briefly extend your vision and identify enemy types faster, or you could pull out your pistol and inflict extra damage on a particularly tough foe - and are easily some of the most fun to pull off. You can refill your MP in a number of ways, including pulling of critical hits in battle. It all ties into a system that tracks the current mental state of your squad. This is a game involving the madness-inducing gobbledegook of Cthulhu, so you’ll need to keep an eye on whether your individual fighters are calm or verging on the insane. The more stressed the character, the more likely they’ll start missing shots or fail to move correctly. It’s a system that feeds into stealth as well, with the need to avoid certain enemies so that your squad doesn’t witness too many horrors and start unravelling as a result. Visually, ACT isn’t particularly striking, sticking mostly to the drab corridors of Nazi bases and the green and brown forest. In fact, most of your time will be spent among the ferns, so much so that it doesn’t take long for you to yearn for a little environmental variety. There's creativity applied to enemy design - especially when you start encountering Nazis warped by their occultist shenanigans - but ACT never quite manages to shed a decidedly ‘old-gen’ look that instantly dates it. There are also some issues with pacing, which can often take the bite out of the impending dread that the game tries to maintain. That being said, this Switch port runs almost without a hitch, although the lack of support for touchscreen controls does seem like a missed trick considering how well ACT suits on-the-go play. While Achtung! 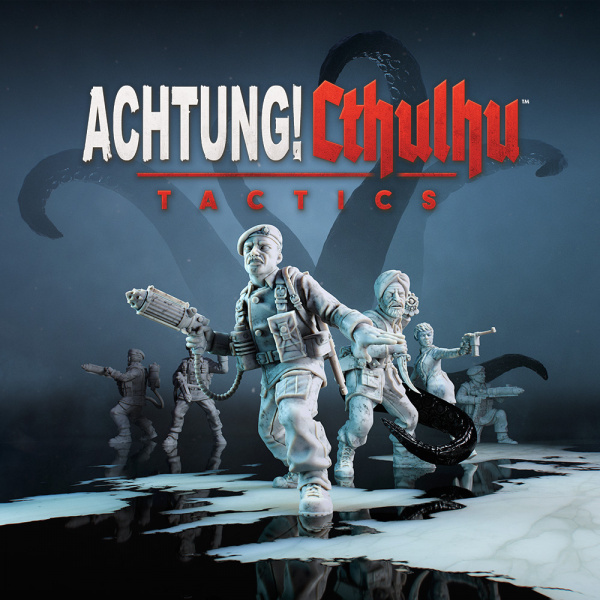 Cthulhu Tactics doesn’t quite capture the intensity of the tabletop game it’s based on, it still does an admirable job of doing something a little bit different with the tactics genre. By focusing more on story and the horror aspect of its lore, you get to experience intense close-quarters battles and ranged skirmishes while building on an unknown threat that could appear at any time, and in any form. Pacing problems and a lack of environmental variety can affect how well this all comes together, but if you’re looking for a more focused tactical/strategy title on Switch, this Lovecraftian odyssey awaits. I'm looking forward to checking this out soon. I've been craving a good xcom-like strategy game for my switch. The customer reviews for this on Steam were all over the place (and a 56 metacritic). This is on my $5 Steam sale list. Mutant Year Zero: Road to Eden is what I am hoping for on Switch. You forgot to mention Wolfenstein and Operation Darkness as some other clear examples of games that mixed Nazis with the dark arts of the occult. 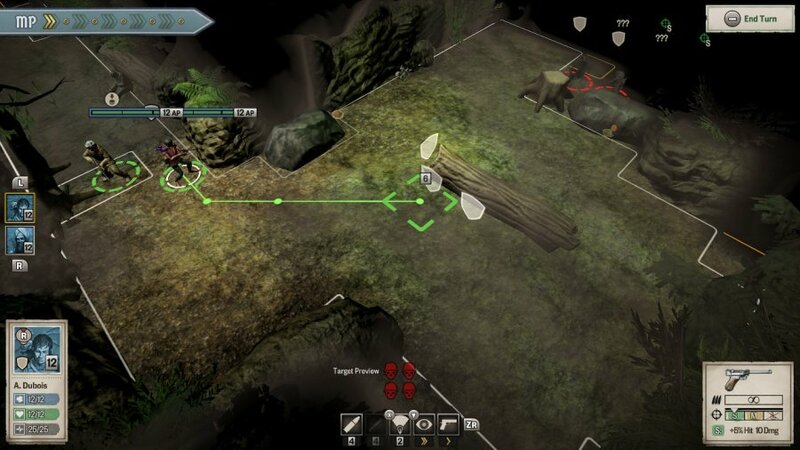 Wasteland 2 is a decent strategy RPG that is sort of like this. It's basically XCOM merged with Fallout. Character creation is kind of involved though. does Wasteland 2 still have switch performance issues? pretty sure it did on launch, forgive me if I am thinking of a different game. or don't forgive me. it's up to you. I personally think Wasteland 2 is worth it, though it's not for everyone. I do forgive, but I never forget. @cherryghost41 Hard West and Phantom Doctrin should be released soon according to announcement. Booth games looks like X-com but in different setup (HW - wild west, PD - cold war). As long as its not bad, this is an eventual purchase for me. This genre is niche enough that I can count the decent ones coming out in a year on one hand. So I'll take what I can get. Wouldn't mind some big ports, like X-com or Mutant Year Zero, though. I also hope Wasteland 3 makes its way to Switch. Like JRPG's, the portability of the switch calls to games like this. We should get the actual Xcom games on Switch. There is no reason not to, they should be able to run fine and the demand is definitely there. ouch, thanks for the tip and the update! i'll make sure i equip it if I do come across getting it. good thing you never forget, because I never remember! Great game so far. Love the Nazi/Lovecraft theme. I mean sure its no Xcom, but this will do just nicely. Pretty excited for Hard West as well. Hello. If you haven't already played it, Into The Breech is rather good. Very good actually. 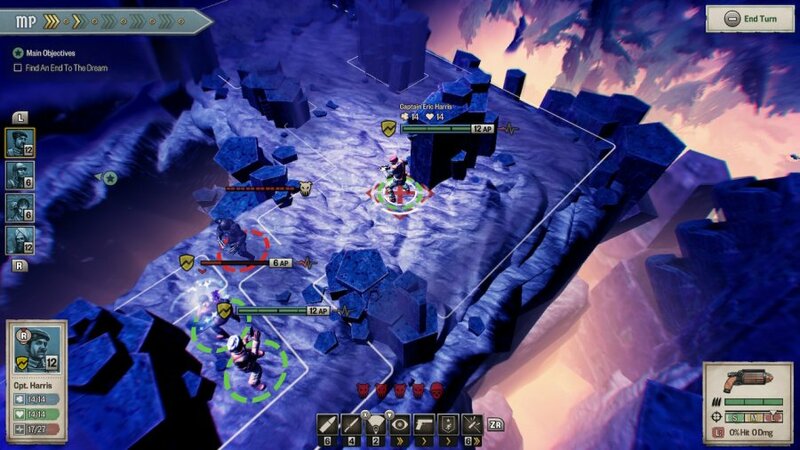 Tight and focussed turn based, isometric tactics.